Mistletoe is another important plant that is used in many holiday traditions surrounding the winter solstice. 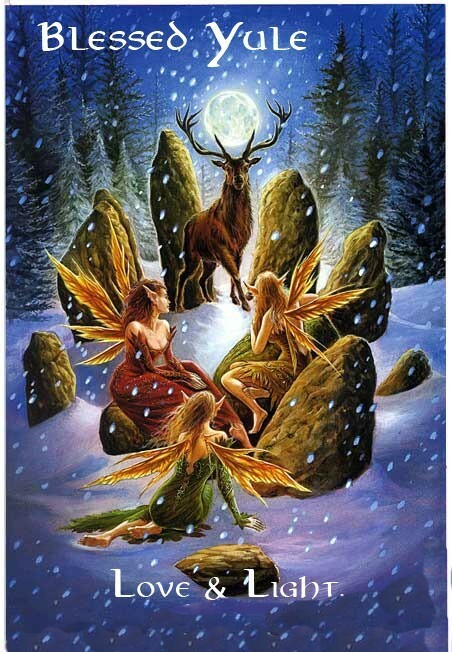 Druids believed that anything found growing on an oak tree had been sent from heaven and mistletoe found on oaks was especially sacred. Said to lose its power once it touches the ground, mistletoe is a holy herb and sacred to many deities. Mistletoe was perceived as being in a category all its own. Although it lives on trees, it's not a tree. Although it's like a plant, it doesn't grow in either Earth or Water. In the Celtic language, mistletoe means “All heal” and it was thought to possess miraculous healing powers and hold the soul of the host tree. Mistletoe would be hung over the entry into peoples’ homes and atop doorways within their homes as a token of good will and peace to all comers. It is said that when warring Viking armies met under a tree in which mistletoe occurred that they would cease battle for the remainder of that day. Today, many people still hang mistletoe in their homes and couples kiss when they meet under the mistletoe. In some traditions each time a couple kiss under the mistletoe a single white berry is removed and the kissing ceases when the final berry is removed. 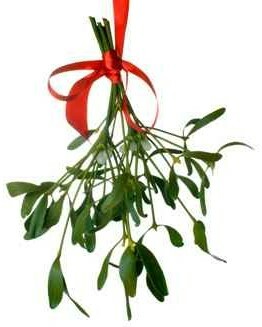 Kissing a lover under the mistletoe will make this relationship last. There is a myth associated with this practice that stated if any unmarried women of the household went unkissed during the hanging of the mistletoe, they would not marry in the coming year. As a matter of fact, you can tie mistletoe with a red ribbon and hang it in your home any time of the year for luck, protection and extra kissing. Adding mistletoe to other love potions increases their power. Place the leaves or berries high on a mantel in the home to protect its occupants. Leave a sprig of mistletoe in the home of someone you want to be remembered by. Twist marjoram and thyme around mistletoe and hang it in the corners of each room to attract luck and good fortune. Carve a ring from mistletoe wood and wear it for protection and to ward off illness. Mistletoe is believed to possess a magical affinity for seizure disorders. To prevent seizures, carry a piece of mistletoe in your pocket or within a conjure bag. Jewelry and charms carved from mistletoe wood can also be worn or carried. The most potent mistletoe seizure charm is a magic knife with an iron blade and a handle carved from mistletoe wood. Mistletoe berries resemble tiny golden moons enhancing the lunar and fertility symbolism. According to Pliny, a piece of mistletoe carried as an amulet helps a woman conceive. Fertility charms are carved from mistletoe wood, and then carried or attached to a pin and worn as a brooch. The most powerful mistletoe jewelry is embellished with pearls. Mistletoe allegedly enhances the reproductive capacity of animals. Not only does it promote conception, it's believed to also prevent miscarriage, particularly for sheep and goats. Hang mistletoe in the barn, or place it on around the animal in question. Be aware that the amuletic part of mistletoe is usually the "wood" - and again, be cautious as mistletoe can be toxic, especially the berries. In Sweden mistletoe is known as "thunderbroom." Place it over thresholds, and hang it from the wall to protect a home from lightning. You can wear mistletoe around your neck to promote invisibility and hang it on a baby's cradle to prevent fairies from stealing the youngster. CAUTION: The leaves and berries of mistletoe are poisonous. Use caution when handling and keep away from small children and pets. Esbat Facilitators Wanted! Please let your DFGL know if you are interested in facilitating a Full Moon/New Moon Ritual. No experience necessary! Your DFGLs are happy to assist you if you are inspired to take on this challenge. Volunteer Today! Capricorn: Cardinal Earth, feminine, "I use"
Aquarius: Air, masculine, "I Know"
Pisces: Mutable Water, feminine "I believe"